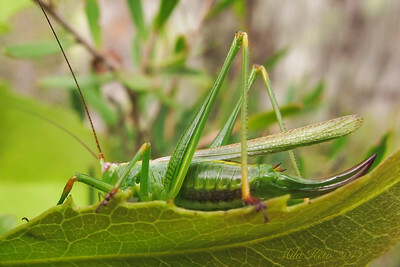 The katydid family Tettigoniidae (Orthoptera: Encifera) has more than 6,500 species in 19 extant subfamilies, 74 tribes, and 1193 genera. 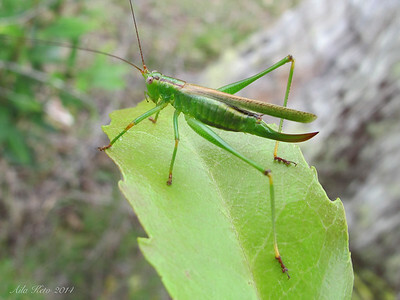 The fossils of present-day katydids are known from the Paleogene — the geological period spanning 43 million years from the end of the Cretaceous Period (66 million years ago (Mya) to the beginning of the Neogene Period 23 Mya). 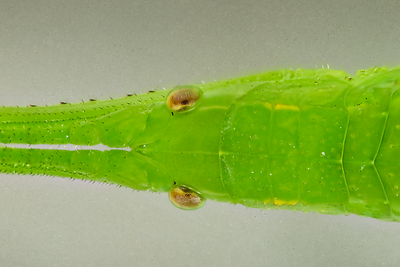 The endemic Australian subfamilies Tympanophorinae, Phasmodinae and Aprochilinae are likely sister (basal) to the remainder of the katydids. 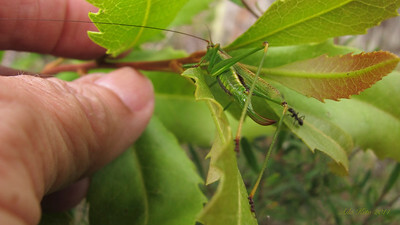 Katydids are well recognised for their complex acoustic signalling and amazing leaf-like tegmina (thick forewings) in many species. 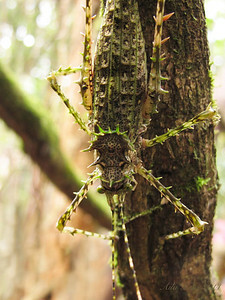 They are mainly active at night with their leaf-like appearance, colouring, mimicry or protective spines providing defences from diurnal predators. 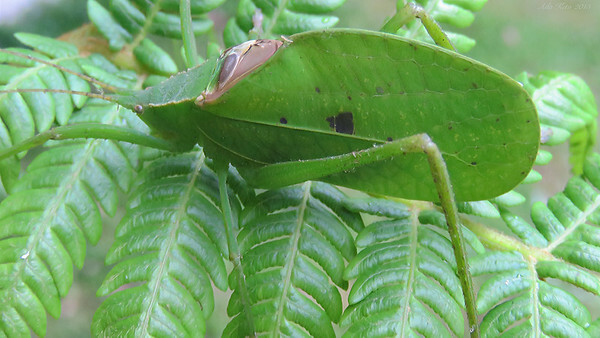 Katydids have one of the most complex forms of acoustic signaling in the insect world — important in sexual selection and territorial displays. 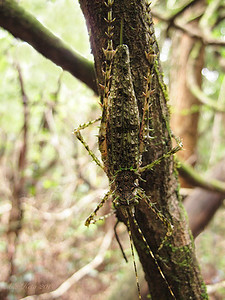 Conocephalomima barameda Rentz, 2001 (Tettigoniidae, katydids, Listrocelidinae, Conocephalomimini) or False Meadow Katydid. 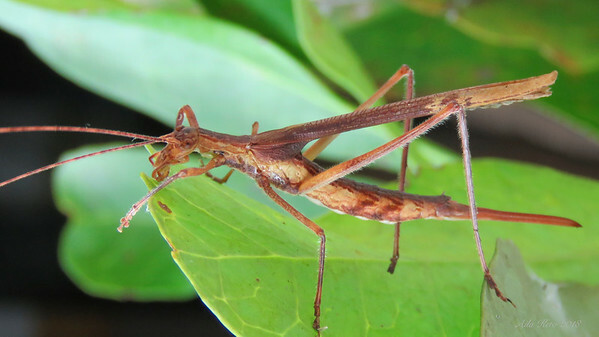 The narrow fastifum and falcate female ovipositor are distinctive characters of the species which occurs from about Brisbane (Queensland) to Victoria. 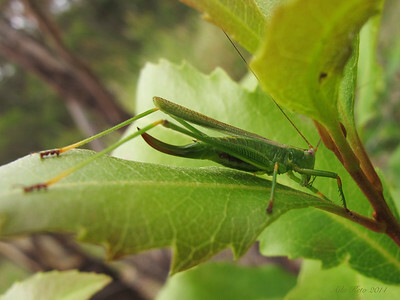 It occurs in a range of habitats from coastal heath to lush wet sclerophyll forests. This site has Eucalyptus campanulata and E. oreades growing on thin soils over rhyolite. 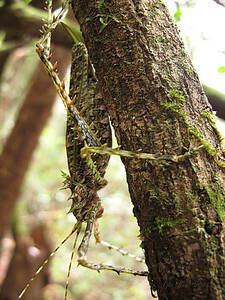 We found this individual on Lomatia arborescent (Proteaceae). 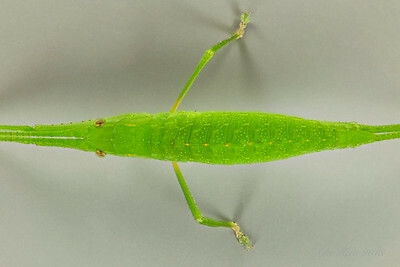 Mastigaphoides haffneri Weidner, 1965 (Tettigoniidae, Pseudophyllinae, Simoderini) or Haffner's Broad-Winged Snub-Nose. 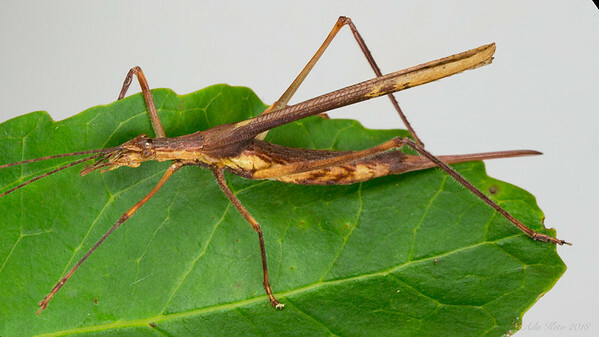 There are four described species in this Australian endemic genus and M. haffneri is known from disjunct populations from the Tweed River in New South Wales to the Wet Tropics, North Queensland. 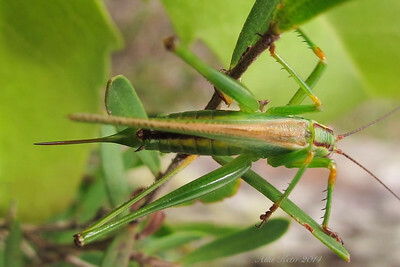 Zaprochilus australis Brullé, 1835 (Tettigoniidae, Zaprochilinae). 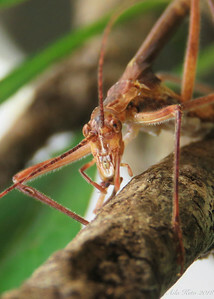 David Rentz confirmed the identity of this species. Isaac Wishart found it on 10 April 2018 whilst working for us on restoration on the ARCS Ankida Wildlife Sanctuary. This site is 633 m asl. 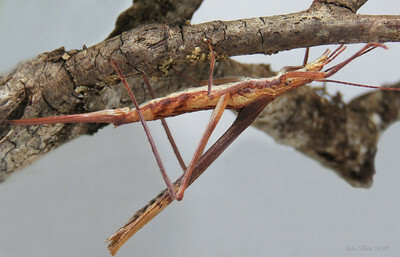 The tegmina (thick forewings) of this female has a 'peculiar' rolled or tubular appearance at rest for good camouflage. 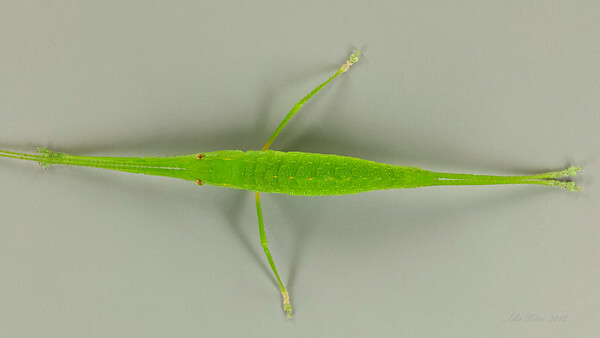 Phricta aberrans Brunner, 1895 (Tettigoniidae, Mecopodinae, Phrictini). Phricta aberrans is one of four species in this Australian endemic genus and the southern-most in its distribution. It is less common than the others and occurs in disjunct localities in north-east New South Wales and south-east Queensland only as far north as the D'Aguilar Range. It is mottled grey-green, a perfect camouflage on lichen- or moss-covered bark. This individual is a female and was found by our photographer friend Nicolas Rakotopare on the ARCS Ankida Wildlife Sanctuary in January 2014.